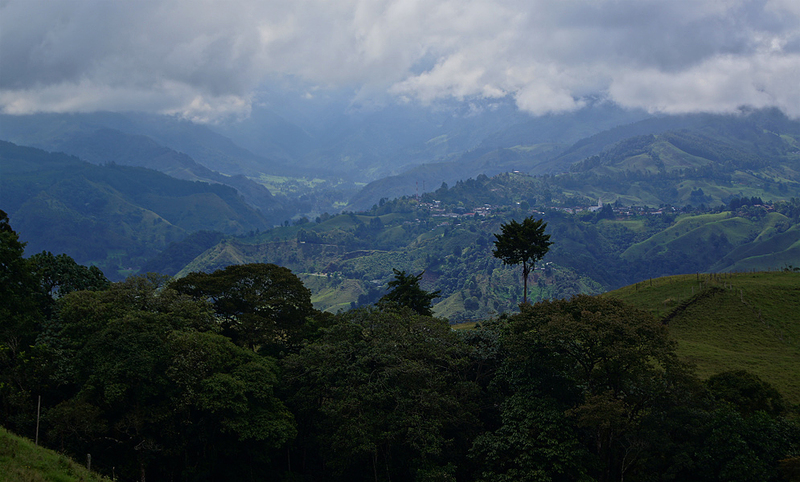 The mountains of Colombia are a notorious strong-hold of FARC forces. Following is a translation (from Spanish) of an open letter from FARC to the Heads of States that are attending the Summit of the Americas in Caracas, Venezueala this month. If you're unfamiliar with the organization, FARC is a revolutionary force in open conflict with the Colombian government. The US National Counterterrorism classifies them as a terrorist organization, and notes their founding in 1964, their Marxist ideals, and their use of violence as a tactic for resistance. Despite the political slant on the situation, this is a voice that is rarely heard on the international stage. After Israel, Colombia is the largest recipient of military aid from the US, which is funding a war on drugs and "terrorism" to the tune of billions of dollars. The war has gone on for decades, and is decidedly messy, with civilians, indigenous groups, and a host of other bystanders caught in the cross-fire. Amnesty International, which has been calling for an end to the US-Colombia collaboration for over a decade because of wide-spread human rights abuses, has more details on the conflict. Thanks to the St. Louis Interfaith Committee on Latin America which had an intern translate the open letter from the FARC to the Summit on the Americas. As those present will undoubtedly recall, in the first CELAC summit held in Caracas, a group of respectable voices expressed to the president their willingness to assist Colombia in finding a political solution to the confrontation our country suffers. The direct response of President Santos was that it was better to do nothing; the resolution of the conflict should be exclusively in the hands of Colombia. Nevertheless, the government of Colombia acknowledges receiving from the United States more than ten billion dollars for war in the last 12 years, calling for direct intervention, turning over the entire territory for air operations, increasing the number of advisers, North American military and paramilitary personnel, receiving the latest technology and subjecting their counterinsurgency plans to the commands of the Pentagon. Pressure is on its neighbors to jointly combat the guerrillas in Colombia, which is described in the most offensive adjectives. For the war, yes, it is willing to receive all participation possible. As often reiterated by President Santos, his purpose is to achieve peace, by good or bad (one way or another). Understanding the course of good means only capitulation and surrender. After the last decade of large operations of military extermination, the truth about the impossibility of a military solution to the conflict is seen. In a similar way, the United States concluded that it was best to leave Afghanistan and Iraq. After half a century of bloody fratricidal conflict, the Colombian regime still insists on an uncertain military victory. The FARC-EP are far from being the monster described by the Colombian oligarchy. We are thousands of women and men who want to realize the dream that was cut short by the death of our liberator Simon Bolivar. We join with the people of our country in the most legitimate political and social aspirations. We will never be separated from these dreams by the vast but regular army patrols, the fleets of bombers and helicopter gunships, the police forces and security forces, paramilitary groups and all kinds of gunmen that lower the hopes of a better life in Colombia. Our armed uprising answers the domestic situation of state violence. There are more political assassinations of leaders of the unions, indigenous (Afro-Colombians) and peasants, than were committed by any of the disastrous Latin American dictatorships in the past. Despite regular elections and the institutional façade, state crimes and inequality guides the social set up in our country to an explosive situation. Each of the powerful economic groups control a vast media monopoly, and almost 200,000 of the victims of paramilitaries in the last twenty years, certified by the Attorney General’s own nation, are just an anecdote for the old press that continues to slander us. One tenth of the population is in a forced position of displacement. The prisons are full of social activists. Only unconditional support for the U.S. interests in the continent and the world explains the generosity of Washington to the Colombian leadership. In our country, they apply the heavy handed enforcement of multilateral lending agencies, privatize as much as possible, fill themselves with transnational investment privileges, worsen labor conditions and cut social guarantees, destroy the peasant economy, surrender to plunder their rich vast territories, and persecute with a vengeance artisan and craft production. GDP growth favors a small group of investors who are not Colombian. And they (cook) the conditions for future aggression against people who are unwilling to admit a similar model for things. Peace in Colombia, always involving popular participation in the democratic decisions of the state, is a basic prerequisite for the peaceful future of the other nations on the continent. We have always opposed a peace that amounts to a mere return to the corrupt institutions generated by this uprising. We stress the need for dialogue to be responsible, facing the Colombian people and their active interference, to recreate the conditions to enable democratic coexistence. Half a century of Colombian blood demands it. In the midst of a global capital crisis, a successful summit of the Americas should deal with much more than economic growth related to market rules. Addressing the respect for sovereignty and independence of their nations, a model of alternative development, and outlawing war as a way of dealing with conflicts. The end of the irrational embargo, as well as the valiant demand of President Correa to integrate free and fully Cuba, we legitimate Argentinian claims over the Falklands and the political solution to the long Colombian conflict are priorities on a continental agenda. Perhaps it is time to address the infeasibility of the war on drugs. As we stated in open letter to Congress and to the people of the United States in April 2000: “…if what you are looking for is a solution following the scourge of drugs, the world must prepare for the larger discussion about the desirability of the legalization of its use, as happened in the past with other scourges such as alcohol and snuff.” It is in any case a serious social problem that cannot be fixed by military means, that agreements require a national and international commitment and participation to the great powers as main sources of global demand for drugs. Mountains of Colombia, April 2012. Labels: DrugWar, latin america, U.S.
this drug trafficking is puzzling in the way that it seems as the root of lots of problems... will legalizing help? sure, for most issues. but will lead to other issues. of course as it is the fuel for the ongoing war-works and 'terrorism' as named, seems unlikely that it will ever be considered..
terror involving ethnicity, as in our country, evokes hatred which is worse.. and takes so many innocent lives.. Thanks zö - The drug-trafficking issue has certainly complicated things - it seems to have infiltrated every movement. Even governments and police are being implemented in some way. It does seem that in their own self-interests, States have largely made the "terrorism" problem unsolvable. I don't know what the answer is, but it is profoundly disappointing that humanity insists on maintaining such levels of violence and hatred - no matter its roots.